Successfully complete, with a grade of “C” or better (a grade of C- will not be accepted), the entire Mount Carmel College of Nursing freshman and sophomore curriculum (either at Mount Carmel or transfer those courses from an accredited college or university) except for Nursing 204, 205, and 206. Attain a minimum cumulative 3.0 GPA for all previous college coursework. ** Credit will not be granted for science courses completed at another institution more than five years prior to the first semester at Mount Carmel. Students accepted into the APP must complete a 12-week term that consists of Nursing 204, 205, and 206 during the summer prior to the start of the fall semester. This demanding and intense program begins in mid-May and concludes in early August. After summer semester, students follow the traditional program for the junior and senior year. Current Mount Carmel students as well as transfer students are eligible for this program if both of the above criteria are met. 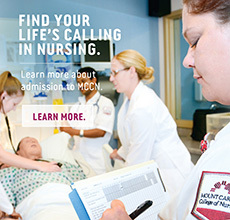 The Mount Carmel College of Nursing Bachelor of Science in Nursing Program prepares graduates to take the National Council Licensure Examination Registered Nurses (NCLEX-RN), administered through the Ohio Board of Nursing. For more detailed admissions criteria and to view our curriculum, please refer to the appropriate pdf files below. If you have college credit from another institution or have earned a college degree, knowing which credits will transfer to Mount Carmel College of Nursing is important. For details about transferable courses and how student status is determined, click on the links below. For more information, call the Admissions Office at 614-234-4CON or e-mail admissions@mccn.edu.